Universal size, 3-piece nylon/fiber laminate construction provides post-operative knee support and immobilization. 3-piece nylon/fiber laminate construction provides post-operative knee support and immobilization. Adjustable side panels with I-beam stays and patella strap allow for correct fit and easy application. Three posterior aluminum stays for proper immobilization. Standard sizes fits up to 29" and XL up to 36" maximum thigh circumference. Adjustable foam pop pad included. length are available with cotton/terry liner and removable stays in 10-pack configuration only. Ideal for post-operative immobilization of the knee joint; collateral ligament sprains; patellar subluxations. Size Max Length Thigh Circ. Universal 20" (10 Pk.) 29"
Universal 24" (10 Pk.) 29"
What are some ways to clean the knee immobilizer? Different doctors have preference for the type of immobilizer used after a Total Knee Replacement Surgery. The Three Panel Knee Splint is an appropriate splint for this procedure post-operatively. 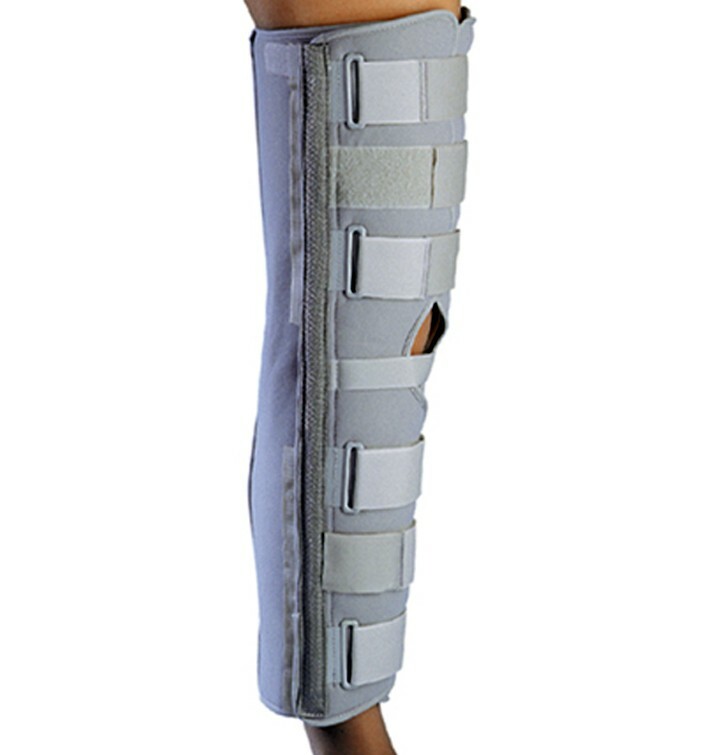 Patient is 5'11" What size knee immobilizer brace do we need? To determine this sizing, take the circumference 4" above the patella and use the size chart located on the product page.